*Millet flour works well in this recipe for a certified gluten-free safe option. ** You might be able to substitute coconut oil or organic palm shortening for dairy-free Whoopie Pies. ***Xanthan gum is required if using a gluten-free flour to keep cookies from being too crumbly. Set out butter and eggs on counter to bring to room temperature. Measure cocoa powder by scooping it into measuring cup and leveling the top with a knife. Add to mixing bowl along with oat flour measured the same way. Measure almond flour by scooping it into measuring cup and gently packing it down, then sweeping the excess off the top with a knife. Whisk together cocoa powder, flours, baking soda, baking powder, and salt. Set aside. Powder erythritol and xylitol in a coffee grinder or Magic Bullet blender until it is finely ground. Beat erythritol and xylitol into butter, creaming the mixture for a minute or two until it is light and fluffy. Beat in eggs, one at a time. Beat in vanilla and xanthan gum. Add dry ingredients and mix till batter is smooth. Chill batter for 1-2 hours, or until firm enough to scoop. Preheat oven to 350 degrees Fahrenheit. Use an ice cream scoop to dispense 8 rounded scoops of batter on to parchment paper. The cookies spread to about 3.5″ in diameter, so you might want to draw circles on the parchment to be sure you don’t space them too closely. Bake for 15-17 minutes, or until a toothpick comes out with only a moist crumb. Cool cookies for 5 minutes on the pan, then move them to a wire rack with a spatula to finish cooling. I created a couple of healthy whoopie pie fillings for you to choose from. The ridiculously fast n’ easy one is the Sugar-Free Peanut Butter Crème Filling, which quickly comes together in a food processor. I got the idea for a peanut butter filling from Bakerella. The more traditional vanilla crème filling is reminiscent of a buttercream frosting since I adapted it from my cupcake frosting recipe here. I like it better than the old version since the addition of ricotta cheese cuts the greasy mouthfeel, giving this revamped Sugar-Free Vanilla Whoopie Pie Filling a luxurious yet light texture. I pureed the ricotta for about 3 minutes, stopping after each minute to give my little Cuisinart Handy Prep (<– shout out to my sister and her husband for that kitchen donation – thanks, guys!) a rest. The smoother you blend the ricotta, the better the texture of the filling. Use red and green food coloring to add a festive tint to the filling. If the food coloring separates out of the filling (i.e. looks curdled), mix some xanthan gum in with a spatula or beaters to smooth out the texture. Start with 1/16 teaspoon, then mix around and observe the filling again a couple of minutes to see if the texture has smoothed out. 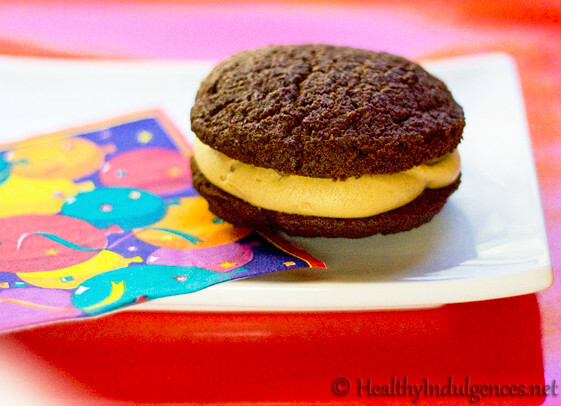 Peanut Butter Whoopie Pies are fun and festive for birthday parties! Process erythritol (or Truvia) in food processor a minute or so to grind it finely. Add ricotta, peanut butter, vanilla, and 1/16 teaspoon of stevia powder (if using) to start. Blend filling 2 minutes, scraping the bowl at the one minute interval. Taste the filling and add more stevia if necessary. Follow the recipe for my Sugar-Free Buttercream Frosting posted here, using 2 Tablespoons of erythritol and 2 Tablespoons of xylitol in place of the 1/4 cup of xylitol called for. Before making the buttercream frosting, puree 1/2 cup ricotta cheese along with 1 teaspoon clear vanilla extract in a food processor for at least 2 minutes, or until smooth. Add the processed ricotta to the finished buttercream frosting, whipping the mixture for another 5 minutes. Add pure stevia extract or powdered erythritol a little at a time to sweeten the filling to your liking. Using a stand mixer is recommended for this particular recipe. Otherwise, get ready to give your arms a work out! (1) One box of NuNaturals NuStevia packets, 50 ct.
(2) One bottle of NuNaturals Vanilla Stevia Liquid, 2 oz. Finally, I have a special coupon code for shopping on http://www.nunaturals.com for you all. Enter BLG1211 at the checkout page to receive 15% off your entire order. Good luck, readers, and stay tuned for a giveaway from Iherb.com coming up next post! « Healthier Decadent Chocolate Mousse – Sugar-Free and Incredibly Easy! 63 Comments on Healthy Chocolate Whoopie Pies are here! Sugar-free, gluten-free, and finger-lickin’ good. I am so excited that you'll be back 'n bakin' for awhile! I hope you enjoy your break. I'm almost home too! I've never had a Whoppie Pie, healthy or non-healthy, but they look wonderful! NuNaturals is my favorite brand of stevia as well! Love love love it! Eek! I hope I win! my wife told me to enter! Excited to see some new recipes…Hope your break and holiday is wonderful! Oh, I'm so happy to see a new post, and these look especially delicious! 🙂 Thank you! These look wonderful!!! 😀 I'm making them for Christmas! Also I posted a link for them on my facebook profile! Yea for a new post! These look really promising. I hope I get to try them out sometime soon. You're back! 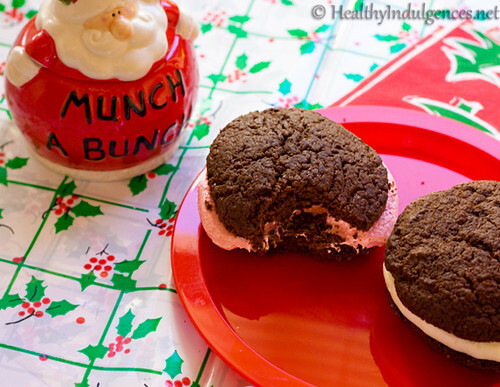 Can't wait to try the new whoopie pie recipe out, they look so festive (and delicious!). Definatly would love to have the extra sweetner around (I've been introducing it to tons of my bakin' buddies!). Thanks for the giveaway chance to win. Glad you are back bakin' & sharin' your recipes with us again. Enjoy your time off, and your bakin'/cookin'!! Hope that is how I am supposed to do this. I am so excited that you are back! So is my diabetic mom!!! Can't wait to enjoy your whoopie pie recipe! Good to see you are back! Thanks for the awesome giveaway! I also posted a link on my FB page. I am so looking forward to trying this recipe! love the blog–need to start watching my sugar the doc says so I will be trying to learn all I can about using special ingredients! I am so glad you are back. 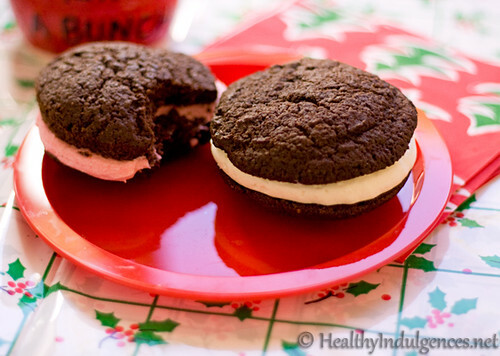 These whoopie pies look yummy, can't wait to make them. I'd love to win!! I use stevia almost exclusively for my sweeteners! So glad to see you're back in the kitchen! Can't wait to see what else you come up with! Love the Whoopie Pie Recipe. Don't know if I'm brave enough to try the peanut butter filling variation but I know I have friends that would love it. I would love to win one of the products. I also shared your link on facebook. Man, these look so good and the photo is so great, I can just taste them! I'm a sucker for anything chocolate really. These look so good! I'm going to try making them tomorrow with the peanut butter filling! YUMMY! Am totally trying these! I am going to try some recipes using liquid stevia in the new year.. definitely want to try flavored ones and to use NuNaturals brand. I'll link to your giveaway too! Boy….have I missed you!!! So glad you're back and what a great start. I made these and oh my….they were so good. I put a tad of peppermint in the vanilla creme and it was amazing….Hope you have a great holiday! so glad you are back! I have made so many of your recipes for my non gluten free/non sugar free family and they love them. I love your recipes. Thanks for adding a recipe for Gobs (that's what we call whoopie pies where I grew up). Can't wait to try them, although first I'm going to make some bean-based cupcakes. apologies if this has been addressed, but why are the net carbs so high in the filling? is that from the ricotta? Anon – The net carbs are from the ricotta mostly, yes. I'm so excited that you're back! Love your recipes! made the whoopies and they are fantastic! I'm at 7,500 feet so added 1/4 each Bkg powder and soda and 2 Tbsp unsweetened coconut milk to each batch. At 8 servings they seemed very dense and heavy, at 12 much more reasonable. Had the most fun cooking them in the cake pop maker my daughter got for xmas. 1 Tbsp per pop, 6 minutes, stuffed them with a SF 7-minute frosting (lime flavored) and they are delicious. The first grade class (and GF teacher) went berserk over them on bday day, and want to see them again for valentines day…they'll be stuffed with pink raspberry SF frosting then. Thank you so much for sharing, I'm very much a “practicing” fan. Keep up the fantastic experiments. omg! I just so love your recipe, very healthy.. perfect for everyone, especially kids. I followed the trail from this sweet collection to your blog, and I'm so happy I did! I can't imagine anything better than a healthy whoopie pie! How fun! Great use of ricotta! Thank you for posting this recipe! Are there any substitutions that are dairy-free to replace the ricotta cheese and butter? Thanks! nevermind the last comment…I didn't see your note about coconut oil. Thanks! I love your site! I'm not ready to add oat and almond flour yet, too many nuts are an issue for me, but I wanted whoopie pies so badly after seeing this that I made a slightly modified version of your chocolate bean-cake, baked in my muffin-top pan to get whoopie pie rounds, and used the pb filling recipe on this post. They're amazing! The Sweet Prima Donna- Brooke B.
I’ve learn a few excellent stuff here. Certainly value bookmarking for revisiting. I surprise how a lot effort you place to make such a great informative site. love woopie pies! especially healthy ones! Where can I buy a healthy whoopie pie already made.